I have seen all 14 plays on offer at Stratford and 9 so far of the 11 at the Shaw. At this point I have no hesitation in declaring “Picnic” at the Shaw the finest production of a play by far at either festival. Author William Inge (1913-1973) has stood in the shadow of compatriots Arthur Miller and Tennessee Williams. 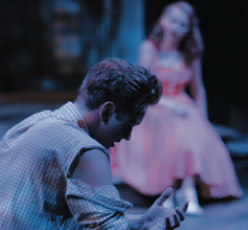 But director Jackie Maxwell has taken this play from 1952 and revealed it as a masterpiece of American drama. Written not for stars but for an ensemble of actors, Inge’s work, with its mixture of humour and heartbreak, seems much like Chekhov set in the American Midwest. As in “Three Sisters” Inge presents us a group of female characters young and old in an insignificant town who feel doomed to a loveless life. Though the town here is in Kansas, the mood is still the same as in Chekhov that somewhere else, perhaps in a big city, life is more exciting, if only there were some way to escape. The focus of the play is the house of Flo Owens, deserted by her husband, and her two daughters, Madge, the town beauty, and her younger sister, the tomboyish Millie. Lodging in the house is a middle-aged schoolteacher, Rosemary Sidney, whose acquaintanceship with small businessman Howard Bevans has never led to a commitment from him. Flo’s neighbour Helen Potts gave up any hopes of romance long ago when only she was left to care for her invalid mother. To add some excitement to her life Helen hires the occasional young drifter to help with the heavier jobs around the house. This particular summer Helen has hired the good-looking Hal Carter, once a friend of Madge's beau Alan Seymour. It has always been assumed that Madge would marry Alan, but she is put off by his lack of passion. Madge is attracted to Hal as soon as she sees him, and so is Rosemary. Things come to head during a dance at a summer picnic when the pent-up sexual frustrations of the characters lead to irrevocable consequences. There is no weak link in this ensemble cast. They work in such harmony it is invidious to single them out. Yet, it seems clear that one way that Maxwell has given the play its tang of realism is by casting the major female roles against type so that we have see passion and seriousness where we don’t expect them. The biggest surprise is Wendy Thatcher (Flo). We have seen here so often in comic roles it’s a wonderful surprise to see her command of nuance and suppressed emotion in a serious part. Her sternness with Madge seems merely old-fashioned, but gradually Thatcher shows us that Flo lives vicariously through Madge and wants her to have the romantic happy-ending she never had. Her anguish when Madge considers leaving is truly shattering. Similarly, it’s a shock to see Goldie Semple (Rosemary), who has played Cleopatra in “Antony and Cleopatra” and Larita in “Easy Virtue”, shed all this glamour to play a woman embittered that she is becoming am old maid. Like Thatcher, Semple gives one of her best-ever performances. She shows how alcohol transforms Rosemary’s lust for Hal into rage against him and makes it horrifying. She gives Rosemary’s abject pleading to Howard finally to marry her an emotional rawness that is heart-rending. Fiona Byrne (Madge) has played her share of innocent young girls, so it is all the more effective to see her as the one female who exudes such a straightforward sensuality. But Byrne, who is always excellent in conveying subtext, shows us fear and sadness lurking beneath this longing. The way Byrne communicates Madge's mixture of emotions when she decides to leave home is amazingly real. Jennifer Phipps (Helen) has moved into playing mothers and grandmothers so it's a treat to see her play a character unable to disguise her own attraction to her new young man. Lisa Norton (Millie), in only her second year at the Shaw, is very impressive in showing a longing to be appreciated beneath her character's tomboy exterior. Mike Wasko (Hal Carter) is superb as the young drifter. He shows the shame and sense of inferiority that lie beneath his character's boastfulness and posturing. Hal is someone who thinks he can be better than he is but his own belief is not enough to counter the knowledge of his past failures. Like all the other characters he needs someone to believe in him despite his faults. Mike Shara (Alan) has the difficult task of playing someone who is not supposed to be interesting. There is more than a little ambiguity about whether he is more emotionally attached to Madge or to old friend Hal. His contemplation of the change of events in that last act is crucial to the whole show. Jim Mezon (Howard) is able to make the distinctly unromantic store-owner sympathetic who otherwise would seem merely callous. In minor roles, Sherry Smith is Rosemary's talkative fellow schoolteacher Irma and Jane Johanson the extremely shy one Christine. Pete Treadwell is the newspaper boy who continually teases Millie. Jackie Maxwell has drawn extremely nuanced, emotionally committed performances from the whole cast always giving each scene just the right focus so that the dilemmas of each of characters are given their due. The impromptu dance of Act 2 is the crux of the whole drama and Jane Johanson's choreography to Paul Sportelli's music brilliantly captures the naturalism of ordinary people gradually falling under the spell of music and rhythm at the same time as she reveals the sequence's symbolic function as a mating ritual. Robert Thomson provides the highly atmospheric lighting. "Picnic" is a triumph for all concerned. It certainly augurs well for Maxwell's coming tenure as the Shaw's new Artistic Director. This is a production equal to the best at any major theatre centre. I wish there were a way for it to transfer to Toronto or elsewhere after its run so that more people could see what it's like when all elements of a production come perfectly come together. Let's hope Maxwell decides to forget that some of Inge's other major plays lie outside the Shaw's mandate. Please give us the rest. Photo: Mike Wasko and Fiona Byrne. ©2001 David Cooper.